Ok. I dunno how I've managed to visit Pennsylvania a zillion times, and most of that through Lancaster County, and I've never been to James Buchanan's house? How? My sisters and BIL brought this back for me from Wheatland, though you know, at some point, I have to go visit it for myself. This is the three-cent postage stamp the USPS issued in 1956, commemorating the centennial of Buchanan's election as our 15th president. Besides being the last guy to serve before Lincoln and his Civil war, Buchanan held several civil servant positions - five times to the House, 10 years in the Senate. A stint as a Minister to Russia, Secretary of State and even Minister to Britain. That's a lot of years to dedicate to public service. He never married, either - the only bachelor president, he usually had his niece Harriet Lane, host all of his functions and pretty much serve as nominal First Lady. "Hal" had been orphaned at eleven years old, and grew up with Buchanan as her guardian. She always plays his hostess, and it turns out she was a social favorite on both sides of the Atlantic. How cool is it that Queen Victoria gave "dear Miss Lane" the rank of ambassador's wife? Pretty cool, for a chick in her 20s. 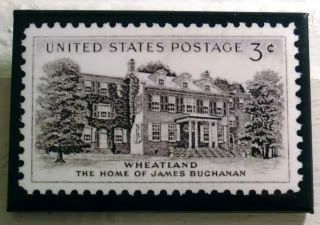 Anyway, looks like once I've visited Wheatland, that will knock off the only presidential house in PA - Buchanan was the only president from Pennsylvania. Hmmm, I wonder if he's related to the Buchanans on One Life to Live. I mean, I know they hail from Texas, but honestly, Llanview, Lancaster, what's the difference?